PSM Forum Welcomes you • View topic - Where are you from? As our membership on this forum increases, it might be interesting to see where our members are from. 1. Visiting schools to give talks on stamp collecting. 2. Have little competitions using stamps at supermarkets or public places. 3. Work with the local post office people to promote the hobby. 4. Perhaps even produce articles or scan postmarks as a group and submit them for inclusion in the PSM newsletter. I am from Johor, Johor Bahru to be precise, but i am currently staying in PJ coz i am still studying in UM. Been missing in the action opf stamp collecting foe a few years but i am back on the track again. Thanks for introducing yourself and telling us where you are from. I forgot to add that I reside in Klang and work in Shah Alam. My calling name is Kenny Wong, originated from Malim Nawar, Perak and stay in Butterworth, Penang currently. I am a factory worker for an electronic factory in Prai. My hobby are, of course stamp collecting is my major, coins and bank notes collecting, orchids gardening, model trains or anything related to railway collecting, trains traveling, and geography/history related knowledge learning and reading. I am also a mother nature lover and love to explore and take adventure in green area. I was previously Penang Philatelic Society member for a year then has been discontinued. I am currently not belong to any philately clubs or society in Malaysia, even PSM, but I am actively to be chatter box in PSM's forum and MyPhilately online social network. I was also a member of StampBoards previously and has been banned away from the forum because of removing all my posted images on that forum. I don't have any official BLOG online as my time is limited for writing anythings on stamps. Malaysia, Singapore, Thailand, Hong Kong, Macao, China, Taiwan, Australia, G.B. and partial British Commonwealth, Canada and New Zealand. 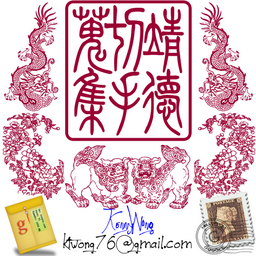 Food and Drink, Anything geographic and mother nature related topics (mainly, wildlife and orchids), interesting history or cultures related (zodiac and CNY stamps is the major) and trains, other thematics stamp will be considered if the stamps look nice for me. Postmark from various place of Malaysia, postage dues and cover, Australia Roo on Map and KGV, partial FMS, and partial Strait Settlement, Stamps and FDC of Persekutuan Tanah Melayu and Malaysia. If anyone would like to start a local stamp club or community or just want to meet me in Butterworth or Penang, please don't be hesitate to drop me an email . Have any space for Asean citizen ? stampheart wrote: As our membership on this forum increases, it might be interesting to see where our members are from. From the Members menu, only a handful indicate where they are located - be in a town or a country. Would like to suggest that members put a town, state and country so we know where you are located. Im James from Sri Gombak, Batu Caves, Selangor. Im working in KL near Jln. Ipoh area. I joined this forum sometime ago, but not sure what to write & where to start. Until I got familiar with most of thread & posting - I was confident to write & put my posting here. Actually this forum really gave a good deal of information which is really useful. I had started collecting stamps when I was about 10 years old. Somehow I had stopped collecting for years and had started again in these few years. Started by collecting thematic - flora & fauna stamps. then got signed up for Soda - its was easier and now collecting like every issue of Malaysia stamps. I started by having a focus in my stamp collecting. - to have a complete set & SS of each country of the world on the flora & fauna theme stamps. I looked up in google for stamp websites for penpal & stamp collectors exchange club. So far I managed to get most of the countries. Other than stamp collecting, I love gardening and painting. Infact beautiful stamps had inspired me to garden & also inspire me in my art. Thanks for telling us about yourself. I also do a fair bit of gardening - am into bonsai cultivation. Used to be reasonably good at art in school but more of abstract. Am fond of celtic art as well but have not taken up painting at the moment. Hope to meet up with you one of these days at the Sentul meetings or the coming fair scheduled for June this year. Hello James! Welcome on board to this forum! Glad to hear that you find this forum useful. Thank you for your detailed introduction! It seems that I have to do mine soon also ! I jointed PSM as junior member in 1994 and expired membership on 1997. Now don't have any membership for Philatelic Society. I never jont any exhibition., coz i don't know how to arrange my collection and no time to do it. As you all know, i only collecting Malaysia modern and only source from Pos Malaysia counter, so... nothing so specials from my collection. What i have, actually you all should have already. I'm working with the contractor who build petrol station, so i got chance to visit various Pos Office in Peninsular Malaysia. Normally just central and north part of peninsular. Ofcoz, i will do this when i have free time and situation allow me to do that. Nothing so special. I just a simple and normal local modern philatelic collector. As long as you enjoy what you collect, that is the main thrust of the hobby and for many of us, at least for me, I collect what interests me (it looks nice, it has a story, it may be unique, etc.). Don't have any special thematic areas that I collect though at the moment, I am looking at FMS, postage dues of Malayan Union and Malaysia and Great Britain postage dues. Also collecting some registered letters (local) for the postal history (as indicated by the postmarks). Have stamps from other countries but not so interested in building up these other country collections though I also pick up German period inflation covers.